South Sudan is at risk of new conflict. Can the U.N. protect its civilians? Note: The opinions and comments stated in the following article, and views expressed by any contributor to In Homeland Security, do not represent the views of American Military University, American Public University System, its management or employees. When Donald Trump was running for president in 2016, he often claimed that “a Trump administration will stop the jobs from leaving America.” But in his first year and a half as president, U.S. companies shipped thousands of jobs overseas. Many of these companies also received huge government contracts. In fact, according to employment data charted by Good Jobs Nation and Public Citizen, federal contractors alone outsourced more than 10,000 jobs while receiving more than $19 million in government contract money. Since Trump became president, the Labor Department certified that more than 93,000 jobs have been lost to outsourcing. That is a slightly higher figure than the average of about 87,000 in the preceding five years. Outsourcing is defined as American companies subcontracting work to developing markets to manufacture products cheaply or to do specialized technical work. When American companies subcontract to foreign companies, it is known as offshoring. Most Americans believe outsourcing is a bad idea. The drastic increase in unemployment as a result of the 2007-2009 Great Recession increased public opinion opposing outsourcing. In 2016, the Pew Research Center surveyed over 5,000 Americans regarding outsourcing and found that 80% believed that outsourcing hurts U.S. workers. In the 1990s, as American corporations began to focus more on cost-saving measures, they began to outsource functions necessary to run a company, but not related specifically to their core business. The rule of thumb was that a company should only subcontract in those areas where it demonstrated no unique capability, such as manufacturing automobile tires or jet engines for a commercial airline company. However, companies also outsourced to reduce costs, such as peripheral business expenses, high corporate taxes, excessive government regulations, and production or labor costs. As a result, these organizations lowered their costs and increased their profits. 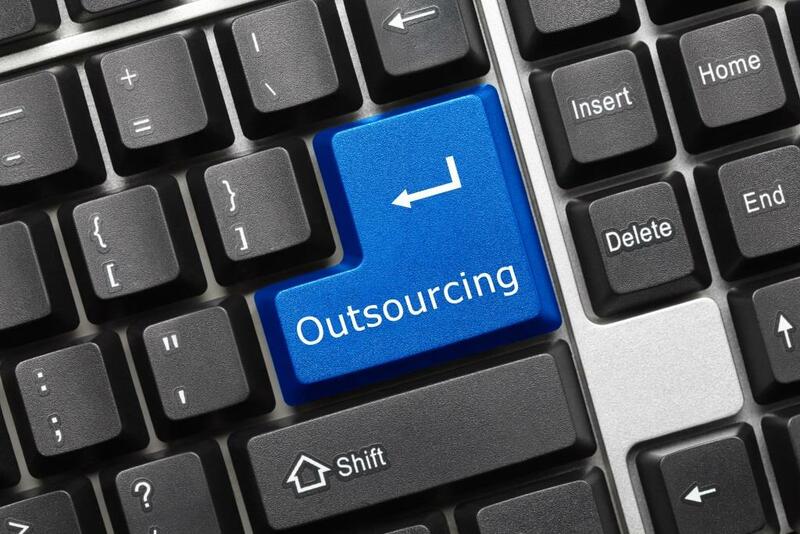 Outsourcing offers companies greater budgetary flexibility and control. It allows them to pay for the services and business functions they need when they need them. Outsourcing also reduces the need to hire and train specialized staff and decreases capital outlay, operating expenses and risk. The most common argument against outsourcing is that it sends jobs overseas, adversely affecting the U.S. unemployment rate. However, according to the Bureau of Labor Statistics (BLS), the U.S. unemployment rate has been declining steadily since 2010, to around 4%. That percentage is well below what BLS considers full employment. The correlation between outsourcing and unemployment is not self-evident. How pervasive is outsourcing in the U.S. economy? According to a report by the Center for American Progress, federal government data was “not designed to link employment gains or losses in the United States, either for individual jobs, individual companies or in the aggregate, with the gains and losses of jobs abroad.” In other words, the federal government does not know how pervasive outsourcing is in the economy. However, the Department of Commerce found that since 2000, American multinational companies have reduced their domestic workforce by 2.9 million workers. These organizations have also increasing overseas employment by 2.4 million. But foreign companies also outsource to the United States. According to the Bureau of Economic Analysis, foreign businesses employed nearly seven million Americans, which accounted for 13 percent of manufacturing jobs and about 18 percent of exports in 2013. Pew reports that British companies employ the most Americans — more than one million people. The UK is followed by Japanese, French, German and Canadian enterprises. The foreign contribution to the U.S. Gross Domestic Product (GDP) is $900 billion annually, mostly from foreign automobile manufacturing plants located in the United States. Until Americans stop wanting to pay the lowest possible prices and corporations stop seeking to cut production costs – which will probably never happen – outsourcing will continue to grow. While outsourcing grows, so do American worries about automated intelligence and other new technologies. A 2018 Gallup poll found that every demographic studied said it saw automated intelligence as a greater threat to American jobs than immigration or outsourcing. Dr. Stephen Schwalbe is an associate professor at American Military University. He is also an adjunct professor at Columbia College. Stephen received a Ph.D. in Public Administration and Public Policy from Auburn University in 2006. Sign up now to receive the InHomelandSecurity eNewsletter.